14 "A conversation with Judy Chu and Jean Quan"
Jean Quan is the mayor of Oakland, California. She is married to Dr. Floyd Huen. Both have reportedly been committed Maoists. As an Oakland School Board member, Quan was appointed by President Bill Clinton to the Title 1 Committee, representing large urban schools. She is Chair-Emeritus of the National School Boards Association's Council of Urban Boards of Education and served on the Executive Committee of the Council of Great City Schools Executive Committee. As a National Kellogg Foundation Fellow, Jean Quan traveled to cities throughout the United States and learned how cities partnered with their school districts to improve education. Quan is a former Maoist, a veteran of the student movement of the 1960's. Quan once "identified" with the defunct Maoist Communist Workers Party. Floyd Huen went to UC Berkeley during the late 1960s where he served as president of the Chinese Student Club, and participated in both the Asian American Political Alliance and the strike for Ethnic Studies. When he moved to New York for medical school, Huen and his wife Jean Quan, co-founded the Chinatown Food Co-op and Asian Americans for Equality, a New York Chinatown-based social justice organization. "Oh, okay." And so you know, I said, "Well, I'll be there next Thursday." . The American-Korean Friendship and Information Center (AKFIC) was created in either late 1970 or early 1971, making its public appearance with a nearly full-page ad in the New York Times (NYT) entitled "Vietnam, Cambodia, Laos - AND Korea Again"? Among the "Initiating Sponsors" for the ad (and for the organization) was Jeanne Quan, Division of Asian Studies, Ethnic Studies Department, University of California, Berkeley, California. This same identification was on the little brochure introducing the AKFIC that came with their booklet, "Operation War Shift: Korea". Most of the "Initiating Sponsors" were either members of the Communist Party USA (CPUSA), the creator of this front organization, or known Marxists and sympathizers, including Victor Perlo, an identified Soviet spy in the U.S. government during WW2. An April 11, 1985 list of was found in the Communist Workers Party papers in the Tamiment Library New York. It included the phrase "membership status" after each name, indicating that it as a CWP membership list. Those named included Jean Quan. During Occupy Oakland in the fall of 2011, it emerged that no less than Oakland Mayor Jean Quan, as well as some of her key advisors, and high-level members of the Alameda Labor Council, were former members of the Communist Workers Party. At Berkeley, Quan gained experience working with the Third World Liberation Front, whose efforts on behalf of minority students led to the establishment of the university’s ethnic studies program. After Berkeley, Ms. Quan moved to Hong Kong, New York and Los Angeles, working in the labor movement. In 1980, she returned to the Bay Area and led a campaign against the Ku Klux Klan after five anti-Klan protesters were killed in Greensboro, N.C. In the mid-1980s, Ms. Quan, who by then had two children with her husband, Floyd Huen, helped elect several progressive candidates to the Oakland school board. She then ran herself, and later became school board president before being elected to the City Council. 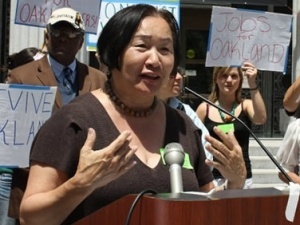 In 2006, Jean Quan, Vice Mayor, Oakland , was one of many prominent Northern California leftists to serve on State Assembly hopeful Sandre Swanson's Honorary Campaign Committee. Civil rights leader Dolores Huerta and her partner Richard Chavez, brother of the late Cesar Chavez, kicked off a two-day, seven county tour of California, December 22, 2007, attending "Holiday Parties for Hillary" in Fresno, Sacramento, Richmond, and San Francisco with hundreds of Hillary Clinton supporters. The statewide tour started on Saturday morning in the City of Fresno at the home of David L. Schecter, Associate Professor of California State University at Fresno, and special guests included Fresno Councilmember Cynthia Sterling. The tour continued in Sacramento, attending a party hosted by campaign volunteers and supporters at the home of Karen Thomas and John McFadden. Early evening, Dolores was in the Bay Area attending the Richmond Holiday Party at the home of Contra Costa Supervisor John Gioia and Jennifer Peck with guests Pinole Councilmember Stephen Tilton, Berkeley Councilmember Kriss Worthington, Oakland Councilmember Jean Quan and Mayor of San Leandro Anthony B. Santos. The first day of the tour concluded in San Francisco at the home of Miguel Bustos and Alex Rivera. In attendance were Supervisor Jose Sandoval and Maria Echaveste, former Deputy Chief of Staff to President Bill Clinton. Jean Quan was one of SEIU’s Asian-American international organizers, and along with Josie Camacho and Victor Uno, were among the founders of the Asian Pacific American Labor Alliance . Jean Quan and Judy Chu. "Unions, their allies, and now Amnesty International have all condemned the use of tear gas as well as the actions of Oakland's mayor, Jean Quan, who initially said the police were justified because protesters threw rocks. Since then the city administration has switched over to damage control. Quan vistited Olsen in the hospital where she shook his hand and apologized for what happened to him. Quan repeated yesterday her prior comments that Oakland is a "very progressive city" and that it supports the goals of Occupy Wall Street." Her statement noted that "some members of Occupy Oakland" want to meet with her and the police chief. "We need to have direct communications between city staff and your representatives," she told the protesters. 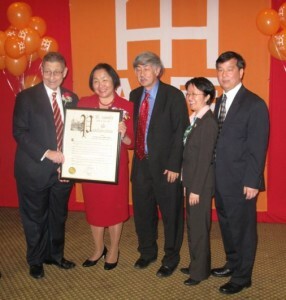 In March 2011, hundreds of supporters came to the Jing Fong Restaurant in Chinatown to help the prominent advocacy and housing organization, Asian Americans for Equality, celebrate its 37th anniversary. Dignitaries such as Rep. Anthony Weiner and State Assembly Speaker Sheldon Silver addressed hundreds of invited guests as they feasted on platters bursting with lobster, whole fish and roast chicken. Silver presented a special award to Oakland Mayor Jean Quan, who last year became the first Asian woman to be elected chief executive of a major American city. During a fundraiser an hour earlier at the historic Nom Wah Tea Parlor, a few blocks away, Quan talked about her groundbreaking and somewhat unexpected victory, which has given many Asian American activists hope for the future. In spite of their large numbers in major urban areas, including New York, there are still relatively few Asians serving in high profile political positions in this country. Just two years ago, Comptroller John Liu became the first Asian elected to citywide office in New York City. In the same election, Margaret Chin became the first Asian woman on the City Council and the first Chinese person to represent Chinatown. It was in Manhattan’s Chinatown in the mid-1970′s that Quan cut her political teeth. She and Margaret Chin were on the front lines in labor protests at Confucius Plaza. Asian Americans for Equality was born out of these demonstrations. Chin went to to serve as one of the organization’s main leaders. Quan went home to California, where she became a political activist and later a City Councilwoman. Quan said Asians cannot be satisfied with their recent gains at the ballot box. The East Coast, she noted, is significantly behind the West Coast when it comes to getting Asians elected to political office. The election of Chin represented the fulfillment of a long-term AAFE goal. But Christopher Kui, the organization’s executive director, said there’s a lot more work to be done. At the fundraiser, Quan talked about her recent invitation to visit the White House. In walking through the front door, she was very much aware she was not simply representing herself or just the people of Oakland, but the hopes and aspirations of millions of Asians who are becoming increasingly comfortable exercising their political power. "A conversation with Judy Chu and Jean Quan"
This event was held Sunday July 10, 2011, Empress Pavilion, LA Chinatown. 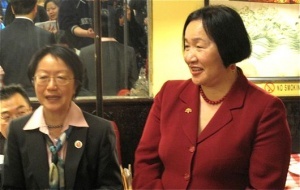 Jean Quan had recently finished her visit to Beijing, Shenzhen and Hong Kong. Oakland Mayor Jean Quan lead a delegation May 2011, to China, where she hoped to persuade Chinese investors to see the city as a center for tourism and shipping. Quan hoped her status as the first Chinese American mayor of a major U.S. city will help the trade mission. Her trip was being organized and paid for by the Port of Oakland. "We're hoping my being there will help make our port a little bit more high profile," Quan said. After her election , Quan was celebrated in newspapers around China. In the United States, President Obama invited her and San Francisco Mayor Ed Lee to the White House for a state dinner with Chinese President Hu Jintao. Quan said that her ethnic ties will help, but she said having a prominent politician on a trade mission has its own cultural value. "People in China don't get how our business (world) is so separate from our government," she said. Quan said having an elected official on such a mission shows that "our political structure blesses this, too." The trip took 12 people, including City Council President Larry Reid and Port Executive Director Omar Benjamin, to three cities in six days. In Beijing, the group met with Hainan Group to try to persuade them to see Oakland as the center of Northern California travel: Yosemite, Wine Country and San Francisco. Among other things, Quan said, they wanted a direct flight from China to Oakland International Airport - which is owned by the port. So excited to be getting out the vote with members of the Wellstone Democratic Renewal Club (WDRC)! Join us and let's make our voices heard: nikki4oakland.com/events. With Jean Quan and Floyd Huen. This page was last modified on 23 January 2019, at 04:03.